Heavy horses are beautiful, noble and incredibly versatile. If you’re looking into one of the bigger breeds you may be looking for something to ride and show, or more likely driving or farm work – which is where these breeds really come into their own. 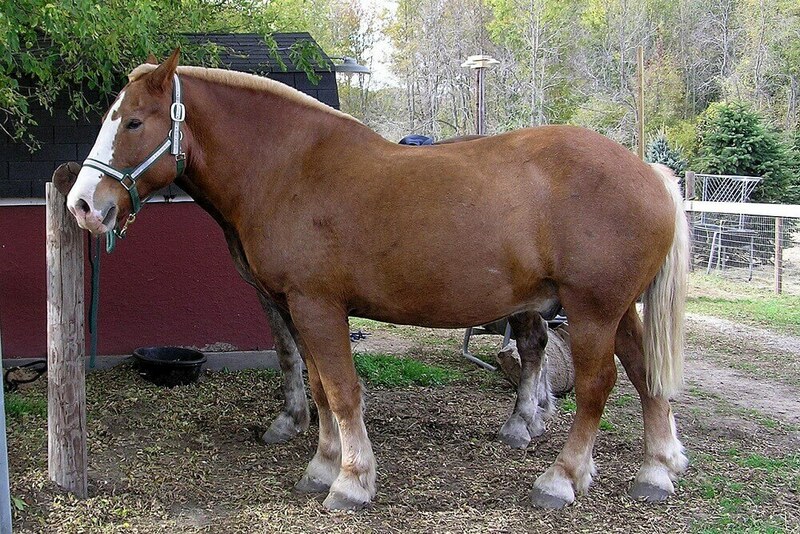 If you’re torn between two breeds, have a look at Belgian Draft Horse vs Clydesdale and see if you can figure out which is the most suitable for you. The Belgian Draft is also known as the Brabant, and until the 1940s the two were basically the same breed. The Belgian draft originates from the Brabant region of Belgium, and may have had ancestors in the Middle Ages, although no hard evidence exists to back up this theory. Belgians are descended from the Flemish “great horse” which was used on the battleground in Medieval times – if you’ve ever seen a Belgian Draft you will have to admit that being charged at by one from the enemy side would be pretty terrifying! Luckily, this is very unlikely to happen in this day and age. The Clydesdale comes from Scotland, where in the 18th century Flemish stallions were bred to local mares, producing stock that were much bigger than the local foals. 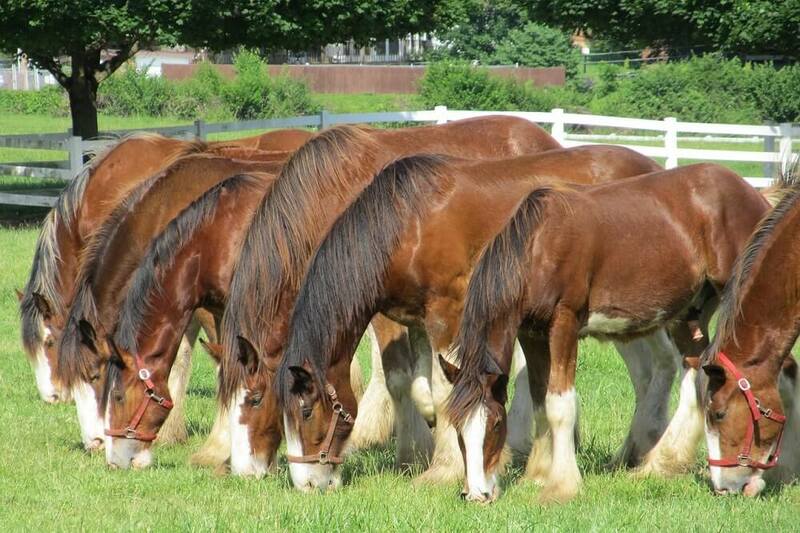 “Clydesdale” was first used as a term to describe the breed in 1826, and the breed has flourished since then. Clydesdales were exported around the world, because of their amazing strength and ability to turn their hooves to heavy farm work – however this declined as farm machinery became increasingly mechanised. Belgians are big. Really, really big! They stand between 16.2 and 17 hands, and the record for the world’s tallest horse is held by a Belgian – his name is Big Jake, and he stands at a breathtaking 20.2 hands. Belgians are also incredibly heavy, ranging from 1,800 to 2,200 pounds. You’ll know about it if one steps on your toe. In the beginning of its history, the Clydesdale was compact and smaller than a Shire or Belgian, but around 1940 horses were selected to breed who had taller genes which would look more impressive in parades and shows. Clydesdales today stand between 16 and 18 hands – this is well over six feet, so they will dwarf most fully grown men! Most Belgian Drafts are chestnut, with a distinctive flaxen mane and tail. Often, white socks and a blaze accompany this main coat color. The shade of chestnut varies from individual to individual, but most are on the lighter side. Bay, black and roan also exist, but the most common color is the reddish chestnut hue. Clydesdales are generally bay, with white markings on the face and feet – some have white spotting on the lower belly too. Black, gray, chestnut and roan also exist in this breed, but the four white legs – white all the way up to the knee, not just a little sock – and a wide facial blaze are considered a desirable trait, and this is considered when breeding these horses. Draft horses are all pretty meaty, and the Belgian Draft is no exception. The Belgian was bred to be taller and lighter bodied than some of their counterparts, but they are still a weighty example of a horse. The head is relatively small compared to the body, and has a well shaped look to it, while the neck is long and high. Good shoulders and a short, straight back are key characteristics. The Clydesdale is a big horse, no doubt about it, but it is also finer than some of its heavy counterparts. The face is straight or slightly convex, with a broad forehead and a wide muzzle. The body is well muscled and very strong, with a beautiful arched neck and high withers and a sloping shoulder. The feet are a big consideration with this breed too, as they should be huge and strong, while the legs that attach to those feet should be strong, oozing great bone and covered with feather. The movement of a Belgian Draft is regular and high, with plenty of power from those massive hindquarters. A proud attitude is a notable feature of this breed’s gait, and because of the massive size they may appear to “stomp”. Clydesdales have a very active gait, with clearly lifted hooves that show the bottom of the foot to spectators, and a happy-looking way of carrying themselves. Long, straight strides with good joint flexion are another key characteristic of the movement of Clydesdales. As with the majority of the heavy horses, faster gaits will feel like sitting on a rocking horse! Despite their massive size, Belgian Drafts are very kind and gentle. Even the stallions are pretty docile, and all the Belgians regardless of gender are noted for their quiet nature. They have a willingness to work, combined with a lively, brave character. If a big horse has a difficult temperament it will be difficult to train – and you don’t want to argue with 2,000 pounds of horse! Luckily, Clydesdales have a notably calm disposition. They are the epitome of the “gentle giant”. They are very easy to train, and willing and eager to learn new things. Belgians are primarily work horses, as their weight and stature makes them perfect for heavy work. However, they have become popular in recent years as show horses and pleasure rides for those who like the bigger mount. Belgians and Brabants are also used for meat, especially in Belgium, as they (apparently) produce a tender meat that is considered a delicacy. In its original incarnation, the Clydesdale was used for agriculture and heavy hauling, due to its massive size and great strength. These days, although it is still used for these purposes, the Clydesdale is used for showing and riding, as well as exhibition. 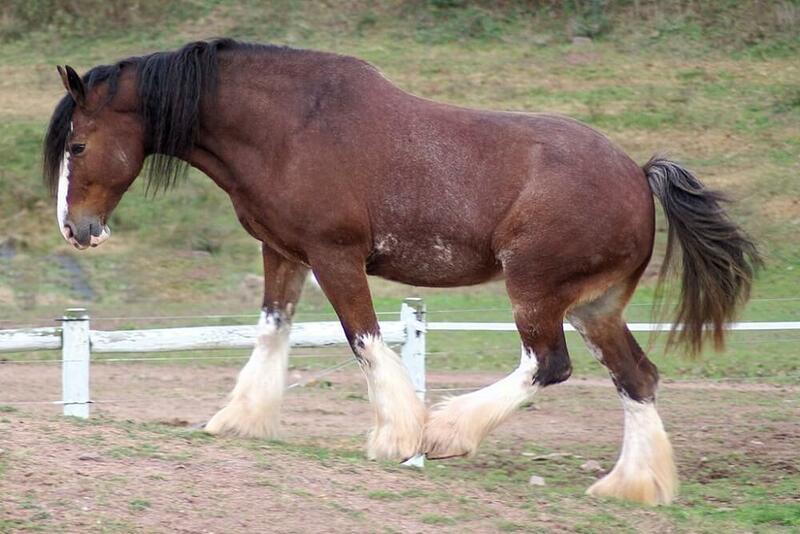 The Clydesdale was made famous by the Budweiser advertising campaign, which has made the breed well known and loved. Clydesdales are also used by the British Household Cavalry as drum horses for parade and state occasions.